I can't even tell you what a momentous day this is. IT IS MY FIRST MANICURE POST ACCIDENT. It was seriously killing me inside to have the same manicure for three weeks, but 1) I didn't have any other nail polish, and 2) I really couldn't even bring myself to do my nails after what happened. And then something changed. One of my fabulous coworkers sent me Essie Pool Side Service as a get well present, and I was ready to get back in the polishing game! Pool Side Service is one of the colors from the new Spring 2016 Collection. It's such a unique shade -- that perfect mix of green and blue with a slightly dusky, dusty finish. It glides on smoothly and easily and is awesomely opaque in two coats. I think this is a very interesting shade for spring. 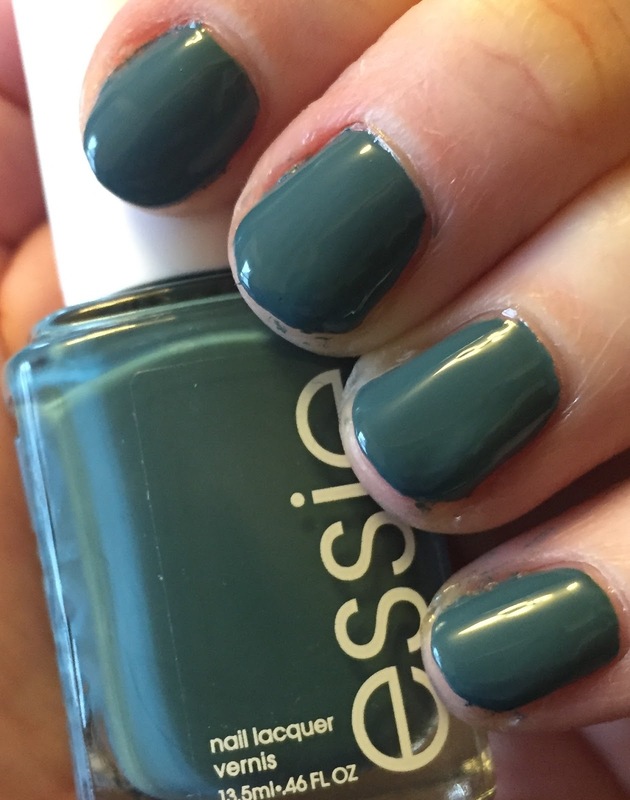 It's on the darker side, which feels more fall to me -- but I like that Essie stepped outside the spring comfort zone and tried something different. I definitely can't wait to wear this on my toes, too (although thanks to my ankle surgery it might be awhile before I'm able to get a pedicure). In any case, I am SO HAPPY that I finally have a different color on my nails! It really helped to perk me up and make me start feeling like myself again. I think I'm going to have to buy a few more colors to get me through the weeks I'll be spending in Cleveland, don't you? I love shades that have gray in them. This is such a unique shade. Glad you're trying to get back to your regular routine. Keep up the good work and hope you heal quickly! This is such a gorgeous and rich shade! It looks stunning on you! How nice of your co-workers! It's almost a little teal, I really like it! Hope you're feeling better! Very pretty. When I broke my leg I wasn't able to get my nails done and wore the same color for 9 weeks. The interesting thing is that it still looked pretty except for the growth. Feel better. This shade is so great! I am loving this collection and am actually wearing the darker green (Off Tropic) right now. What a pretty shade! Love that it's a darker shade for Spring too!